In 1787, army-lieutenant and chemist Carl Axel Arrhenius found a rock in a quarry near the Swedish village of Ytterby which he suspected contained the newly discovered element tungsten. Analysis by other chemists did not bear out his suspicions, but ultimately four new elements were identified from Arrhenius’s ytterbite. The first of these was recognized as a new oxide by Johan Gadolin in 1787 and named yttria. The new element within this oxide was therefore called yttrium, and today is one of four elements named for the village of Ytterby, the others being terbium, erbium, and ytterbium. Yttrium is a fairly common rare earth element and serves an extremely broad range of functions. One of the most widely used yttrium-based materials is yttria-stabilized zirconia (YSZ), an extremely hard, non-reactive ceramic that remains chemically stable even at high temperatures. YSZ can be purchased in the form of water-based ceramic pastes for use by hobbyists, formed into knife blades that are harder than steel, used in restorative dentistry to construct crowns and bridges, and coated on metal components in engines to prolong their life by serving as a thermal barrier. Additionally, YSZ can conduct ions, a property that along with its stability at high temperatures lends it to use as a solid electrolyte in solid oxide fuel cells as well as in sensors such as those that detect oxygen content of exhaust fumes. In addition to being integral to inherently useful materials like YSZ, yttrium can serve as a major component of substrate crystals and ceramics that can be doped or otherwise manipulated to exhibit useful properties, and can also serve as a dopant itself in some cases. Doping yttrium oxide, yttrium orthovanadate, or yttrium aluminum garnet (YAG) with certain lanthanide ions yields phosphors that are used in television and computer display screens in as well as in lighting applications. Notably, europium-doped yttrium lattices produce red phosphorescence that is essential for modern color screens, and cerium-doped YAG is used in the production of white LEDs. Yttrium iron garnets exhibit a range of properties, including the Faraday effect, low absorption of infrared wavelengths, and a high Q factor for microwave frequencies, that make them useful for microwave communications devices and magneto-optical systems. Yttrium oxide, yttrium orthovanadate, yttrium lithium fluoride, yttrium iron garnet and yttrium aluminum garnet can all be used in combination with appropriate dopants as gain media for lasers. YAG crystals have also been used as gemstone simulants, but have served this function less since the introduction of synthetic cubic zirconia. As a dopant, yttrium is used to impart shock resistance and low thermal expansion to glasses and ceramics, including the glass used in many camera lenses. In metal alloys, it generally improves workability and resistance to crystallization and to oxidation at high temperatures. It is specifically used to reduce grain size in alloys of chromium, molybdenum, titanium, and zirconium, increase strength of aluminum and magnesium, and to produce nodular cast iron, which has increased ductility as compared to conventional cast iron. Aside from these major industrial functions, yttrium has a few other applications. Several yttrium compounds are notable for their ability to function as superconductors up to relatively high temperatures. In particular, yttrium barium copper oxide was the first material known to exhibit superconductivity at a temperature above the boiling point of nitrogen. In medicine, radioactive isotope yttrium-90 is used in cancer treatment and for some types of high-precision surgeries. Yttrium catalysts are used in the polymerization of ethylene. Yttrium is sometimes also found in the electrodes of spark plugs and mantles for propane lanterns. Yttrium is found in most rare earth minerals and some uranium ores. Despite having a lower atomic weight than even the light rare earths (LREE), it behaves more like a heavy rare earth element (HREE), and occurs in the highest concentrations in minerals rich in HREEs, most notably xenotime. It can be found in smaller quantities in LREE-rich minerals like monazite and bastnasite, and can make up a significant percentage of rare earth concentrates derived from ion adsorption clays. Pure yttrium oxide is usually isolated from mixed rare earth oxide ores by dissolving them in sulfuric acid and fractionating the mixture by ion exchange chromatography. Yttrium's most important use is in making phosphors which are used in CRT displays and in LEDs. Yttrium is also used in the production of superconductors, electrodes, electrolytes, electronic filters, and lasers. Yttria stabilized zirconium oxide is used in high temperature applications, such as in thermal plasma sprays to protect aerospace high temperature surfaces. Crystals of the yttrium-iron-garnet (YIG) variety are essential to microwave communication equipment and yttrium-aluminum-garnet (YAG) crystals are used as laser gain media. Yttrium is available as metal and compounds with purities from 99% to 99.999% (ACS grade to ultra-high purity). Metallic forms include pellets, rod, wire and granules for evaporation source material purposes. Yttrium nanoparticles and nanopowders provide ultra-high surface area. Yttrium oxides is available in powder and dense pellet form for such uses as optical coating and thin film applications. Oxides tend to be insoluble. Fluorides are another insoluble form for uses in which oxygen is undesirable such as metallurgy, chemical and physical vapor deposition and in some optical coatings. Yttrium is also available in soluble forms including yttrium chloride, nitrate and acetate. These compounds can be manufactured as solutions at specified stoichiometries. Yttrium is a Block D, Group 3, Period 5 element. The number of electrons in each of yttrium's shells is 2, 8, 18, 9, 2 and its electron configuration is [Kr] 4d1 5s2. 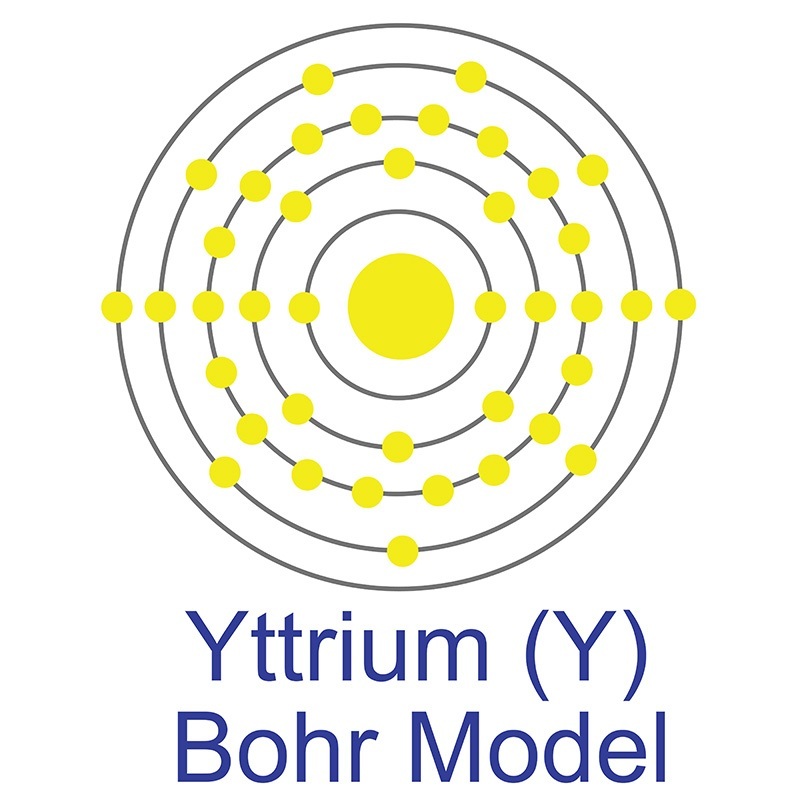 The yttrium atom has a radius of 177.6.pm and its Van der Waals radius is 200.pm. In its elemental form, CAS 7440-65-5, Yttrium has a silvery white appearance. Yttrium has the highest affinity for oxygen of any element. This characteristic is the basis for many of its applications. Yttrium is not found in nature as a free element and is almost always found combined with the lanthanides in rare earth minerals. While not part of the rare earth series, it resembles the heavy rare earths which are sometimes referred to as the "yttrics" for this reason. Another unique characteristic derives from its ability to form crystals with useful properties. Yttrium was first discovered by Johann Gadolin in 1794. The name yttrium originated from a Swedish village near Vaxholm called Yttbery where the ore from which it as first isolated was discovered. Insoluble compounds of Yttrium are non-toxic, although water soluble compounds are somewhat toxic. Safety data for Yttrium and its compounds can vary widely depending on the form. For potential hazard information, toxicity, and road, sea and air transportation limitations, such as DOT Hazard Class, DOT Number, EU Number, NFPA Health rating and RTECS Class, please see the specific material or compound referenced in the Products tab. The below information applies to elemental (metallic) Yttrium. Persistence and degradability: No further relevant information available. Bioaccumulative potential: No further relevant information available. Mobility in soil: No further relevant information available. Yttrium has one stable isotope, 89Y.